Rising up to block part of the star-studded sky, the New Technology Telescope (NTT) cuts a striking and dramatic figure in this European Southern Observatory (ESO) Picture of the Week. 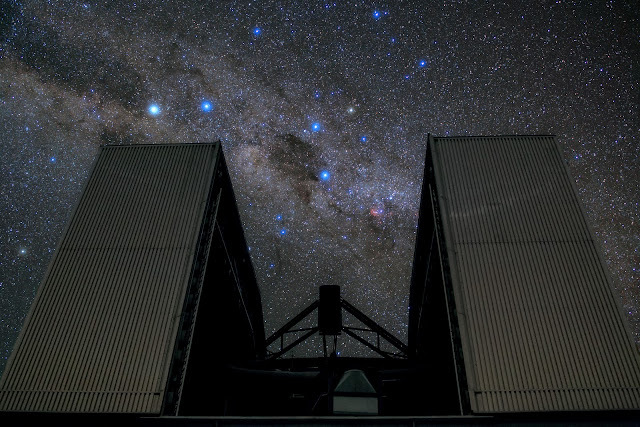 Located at ESO's La Silla Observatory in the Chilean Atacama Desert, the NTT was inaugurated in 1989. It was the first ever telescope to have a computer-controlled main mirror. This 3.58-meter mirror is very flexible and its shape can be continuously changed, allowing astronomers to counteract deformations due to external influences such as wind, temperature and mechanical stress mid-observation in order to see the objects as clearly as possible. Complementing the NTT’s groundbreaking technology is the innovative design of its housing. Its octagonal dome is relatively small and includes a series of flaps that ventilate the structure with reduced turbulence, allowing air to flow smoothly across the mirror. The dome walls can be opened entirely—as opposed to only opening the roof, as with conventional domes—to reveal large swathes of the southern sky. This image was taken by ESO Photo Ambassador Babak Tafreshi.